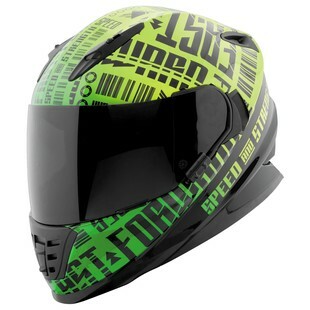 The new Speed & Strength SS1310 Fast Forward Helmet is a bold, in your face graphic of the much beloved SS1310 helmet. Coming in three different colorways to choose from, the Speed & Strength SS1310 Fast Forward Helmet is a leader in "bang for the buck". The helmet comes with an A.T.P.A. Advanced Thermo-Poly Alloy Shell, All Clear! sight system optically correct, anti-scratch, anti-fog and UV resistant face shield, and meets or exceeds DOT standards to keep you safe. The helmet is also comfortable, with a removable, washable and moisture wicking liner and the Air Strike direct course ventilation system to keep you cool when riding on hot days. Overall, the Speed & Strength SS1310 Fast Forward Helmet is a fresh, exciting take on a tried and true helmet platform at a price that won't break the bank.